As Rudolf Brazda, one of the last wearers of the Pink Triangle, passes away, Ben Summerskill, Chief Executive of Stonewall, reminds us of why this passage of history is still relevant today. In Martin Sherman’s celebrated play Bent, the protagonist enters Dachau with the choice of admitting to Judaism or homosexuality. In an attempt to avoid the very worst of eventualities, he chooses the former. Homosexuality was the last taboo of Hitler’s regime. Viewed as weakening the ‘master race’, gay men and lesbians were systematically targeted by the Nazi regime and around 100,000 men were arrested on charges of homosexuality. Even Ernst Röhm, a man so closely allied with Hitler they were on first name terms, was not exempt and it was with this excuse that the Nazis ordered his execution. But what happened to the wearers of the pink triangle is less a historical curio and more a very contemporary lesson. When Rudolf Brazda was deported to Buchenwald he described his social exclusion from the other prisoners – they isolated him, called him a fag and added extra persecution to his daily existence. This cruelty is all the more remarkable set amidst the stories we hear of prisoner solidarity in Nazi work camps and death camps. The homophobia encountered by the gay inmates was indicative of the time – at the liberation of the camps in 1945, gay prisoners were the only ones not freed; instead they were forced to serve out prison sentences for ‘criminal’ activity. Under the Nazi regime, the law had been extended to criminalise any homosexual acts in which ‘objectively the general sense of shame was offended’. It was chillingly easy for the Nazis to reverse the progress that had previously been made. Without legal equality, it was too easy to argue that lesbian, gay and bisexual people did not deserve fair treatment –a lesson that echoes today. With all of the progress towards equality in Europe, some people may feel that stories of discrimination are teachings of a history lesson. But even today we hear reports of prisoners facing homophobic bullying throughout the justice system. Polling commissioned by Stonewall in 2008, Serves You Right, showed that more than a third of lesbian and gay people think they would be treated worse than a heterosexual if they were suspected of committing a crime. In another survey, YouGov found that three in four victims of homophobic hate crime had not spoken out about their persecution. 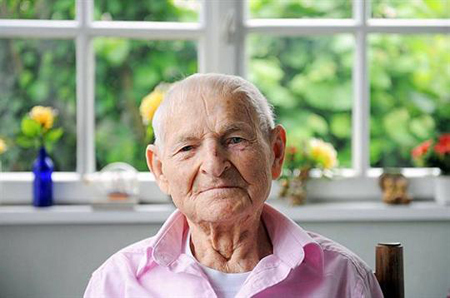 In 2009, when Brazda spoke out publicly about his experiences, he described the ‘unspeakable’ horrors of the treatment of the Pink Triangles – those marked by the Nazis as homosexual – and said the guards had ‘no mercy’. When asked why he didn’t speak out before, Brazda replied simply ‘before, no one cared’. Given that the pink triangle memorial at Dachau was only built in 1995, more than 40 years after Yad Vashem, the iconic Holocaust memorial in Jerusalem, maybe he was right. The passing of Rudolf Brazda reminds us that the pink triangle will soon no longer be living history. But in a world where lesbian, gay and bisexual people are still persecuted for their sexual orientation, Brazda’s passing reminds us of the brutality that can go hand in hand with these views. I recall the theme of Holocaust Memorial Day several years ago. It remains pertinent today: lessons learned, lessons still to learn. Ben Summerskill is Chief Executive of Stonewall, the lesbian, gay and bisexual charity.